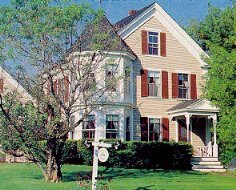 Built in the 1860's, English Meadows Inn is a Victorian farmhouse with attached Carriage House which has ten unique guestrooms with private baths, a spacious apartment and a secluded two bedroom guesthouse. It has been operating as an Inn for more than 80 years and is ideally located within a few minutes stroll to the village square and harbor in Kennebunkport. 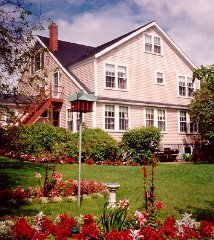 The Inn is furnished in antiques, hand sewn quilts, afghans and local works of art. There are several ocean beaches, museums, restaurants, shops, antiques, galleries, golf and amusement parks nearby. Your hosts, Kathy and Peter, invite you to relax in the homey atmosphere of the Bed and Breakfast and meander about the spacious grounds while sharing travel experiences with other guests. A scrumptious full breakfast is served each morning and is included in the rate. Coffee, tea and juice are available for early risers. English Meadows, a 3-diamond Inn, is open all year. Major credit cards accepted. No smoking throughout Inn.